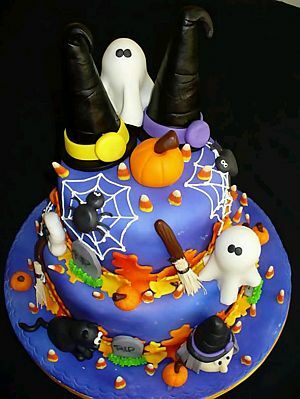 Halloween parties are an opportunity to demonstrate how creative you can be and surprise everyone with an unforgettable party. An important part of this task has cake or pie, and it is for this reason that we present below a selection of models that you may find useful. This first model has two floors, a blue cover and a series of fun decorative details such as ghosts, witches hats, spiders and cobwebs. 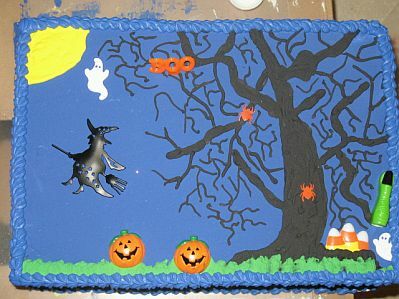 If you prefer a 1 floor model, this is a good choice, it is a cake with blue background decorated with the silhouette of a tree by which some spiders up on the grass with pumpkins and ghosts, and on the side , a witch flying on her broom, complete the work. 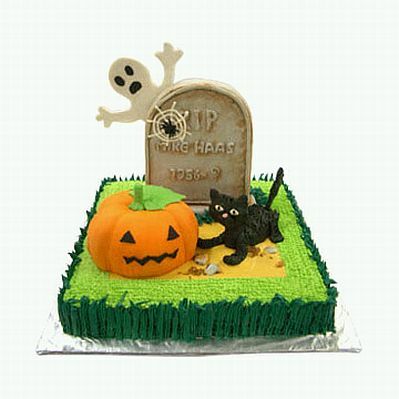 Beauty halloween cake three floor, each of them has a different decorative theme, the first depicting a cemetery, the second to a haunted house and the third, to the house of a witch. 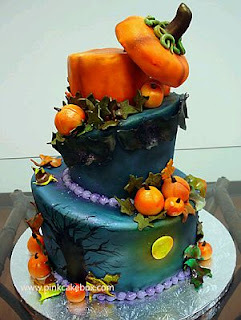 Lovely halloween cake that can actually be considered a work of art, decorated with pumpkins and leaves. If you prefer something more dramatic, this two floor Halloween cake, is the one, is decorated in black with which represents some haunted houses, and trees, on top representing the death. 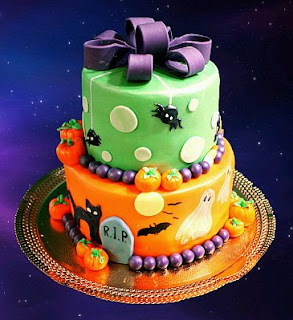 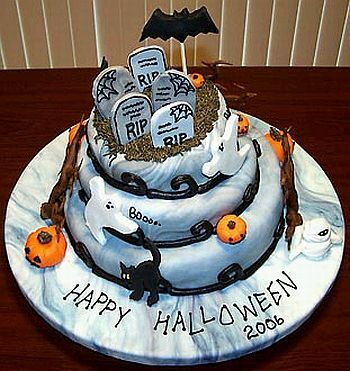 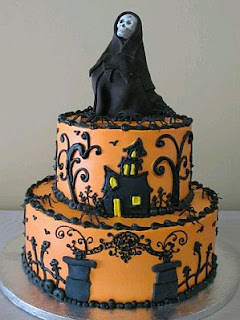 Another beautiful cake, 1 floor decorated with a pumpkin, a tombstone, a ghost and a gloomy black kitten. 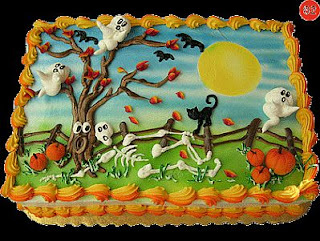 If you prefer something sweet, this cake is ideal for Halloween, is lovingly decorated with ghosts, spiders and black cats, plus some pumpkins. And how about a cake that represents a graveyard full of tombstones and ghosts, perfect for your Halloween party. 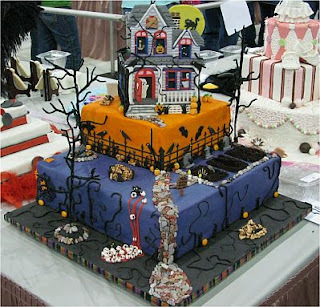 If you prefer something more elaborate, this model is indicated, each floor is decorated with attention to the smallest details and at the top you have a house full of ghosts. 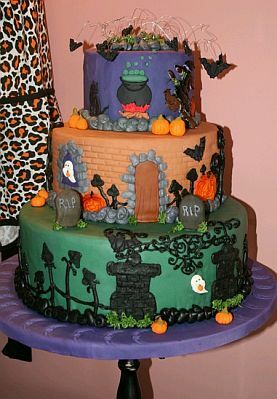 Finally, another cute cake, an apartment decorated with some ghosts, skeletons and pumpkins.